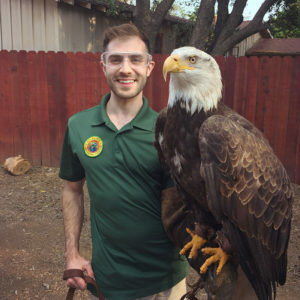 Justin is thrilled to be working at Wildlife Learning Center, achieving his lifelong dream of working with animals. Justin attended UC Davis where he majored in Animal Biology. Some of his favorite classes included Animal Behavior, Nutrition, Raptor Biology, Management of Birds, and Herpetology. For his senior project he had the opportunity to study abroad where he earned an internship at the National Zoo and Aquarium in Canberra, Australia. For almost three months he worked alongside keepers on their daily routines, caring for everything from tamarins to giraffes and of course kangaroos and koalas. During college, he also became extremely involved in environmental advocacy through the campus CALPIRG chapter. Justin quickly rose to positions of leadership coordinating the Protect the Oceans and Campus Climate Challenge campaigns, which aimed to prevent overfishing and reduce global warming pollution. After graduating and moving back home to Los Angeles, he was accepted into the Los Angeles Zoo’s Animal Keeper Training Class. There, he furthered his education in animal husbandry by working on the tiger, rhino, bird show, and chimp strings. Justin is looking forward to training and building a relationship with the animals at WLC while sharing his excitement and passion for these animals with the public.